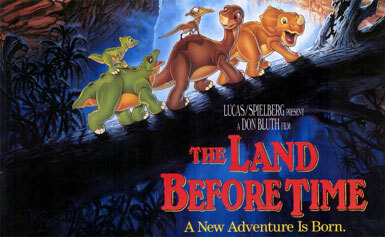 I really can’t imagine a film like “The Land Before Time” being released today. As a kids film it teaches about strength, courage, and the willingness to look for hope in darkness. But as a film in general, director Don Bluth offers a story drenched in sadness, terror, and an almost endless amount of sadness. “The Land Before Time,” like much of Bluth’s work, has held up monumentally well over the year with a beautiful eye for detail, painting a massive world on the threshold of evolving in to something new, while also losing much of its own species to death and turmoil. After Little Foot is born from his mother’s egg, he’s exposed to a massive and dangerous world where he lives alongside his mother and grandparents as a band of slowly dwindling Sauropodas (or “long necks”) that spend their days looking for food in the high trees. As the land around them is dying and other beasts fight for food, Little Foot’s family travail across dangerous lands to look for the mythical “Green Valley” a place said to house miles of edible foliage for Little Foot and his family to live on for decades without worry. Much in the vein of Disney’s Bambi, Little Foot has to grow up very quickly, when his mother dies during an effort to protect Little Foot from the horrible Sharp Tooth, a T-Rex prone to preying on beasts in the wilderness. Grief stricken and alone, Little Foot follows the signs left by his mom to find the Great Valley and teams with a group of other young dinosaurs to meet their parents there as a great earthquake separates loved ones. Unlike the sequels, “The Land Before Time” treats its audience as a mature crowd that is capable of learning about loss, life, and death. The stunning animation really helps these dinosaurs become lovable and flawed characters, all of whom are struggling to hold on to some form of light in a dimming world around them. Littlefoot immediately has to mourn his mom and press forward with his new allies, all the while learning to survive on his own and cooperating with individuals he was always told to hate for a long time. Bluth is no short supply of a compelling often heartbreaking narrative, as much of the obstacles Littlefoot and his friends face are harrowing. Bluth also introduces a slew of equally interesting and likable characters including Cera the Triceratops, Ducky a “swimmer,” an eccentric flyer named Petrie, and an abandoned dinosaur named Spike. The voice work from the cast is strong and Bluth is able to garner some fantastic performances from the children that lend a depth and complexity to each character, conveying genuine sadness and anxiety. “The Land Before Time” really is a marvelous and consistently awe inspiring spiritual journey that ends on a note that may or may not symbolize the death of its characters and the species of dinosaurs that set the stage for a new period in time. Regardless, “The Land Before Time” has sustained its timelessness and maintains a genuine sense of beauty to it that will appeal to its young audience. This entry was posted in Movie Reviews and tagged Action, Adventure, Animation, Dinosaurs, Drama, Family, Fantasy, Kids, L. Bookmark the permalink.